The Stones are celebrating their 50th anniversary in rock and roll at present (On 12 July 1962 the Rolling Stones went on stage for the first time at the Marquee Club in London’s Oxford Street.). Some of us have danced and hummed to their tunes for that long and others for almost that long. As anyone who has been to one of their shows realises, these lads rock live too and after a concert, you still want to hear them that way or have t-shirts, posters of them grinning at you and the like just hanging around the corners allocated to fun in your home. 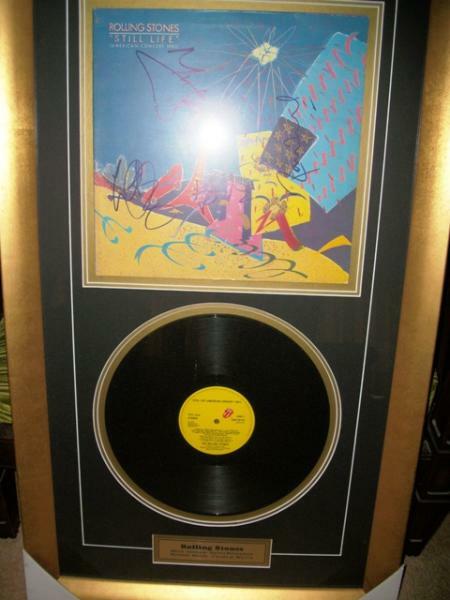 A staffers autographed and framed Still Life by the Rolling Stones is one such collectable that fits this bill. 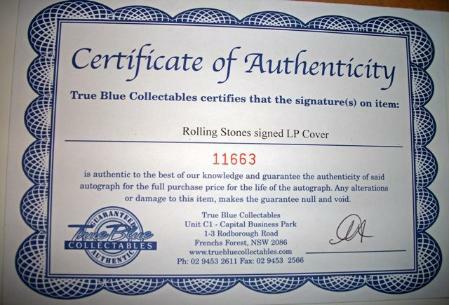 This certified item is termed ‘Rare’ when autographed like this by purveyors seeking to sell you another and orders must be placed. This one cost around $450.00 when purchased a few years ago. A few months later a visiting friend, also an American, offered $2000.00 for it, which, as you’re seeing it still now (no pun intended) was declined. This cover and mint vinyl 1982 US 10-track LP recorded live on the 1981 American Tour, is signed by Charlie Watts, Mick Jagger, Keith Richards and Ronnie Wood in dark felt-tip on the front of the gatefold picturesleeve. If it had Mr Wyman’s signature it would hold more investment value to collectors, and for us, emotional value but would confuse when exactly it was created as a collector’s item. Although signed by current memebers, the absence of bassist Bill Wyman’s autograph shows it was made after this tour and perhaps even after this gent left the Stones. Mr Wyman was part of the tour in 1981. Interestingly, in July 1981 his "(Si, Si) Je suis un rock star" was a top-20 hit in many countries. The 1989-90 Steel Wheels/Urban Jungle tours was his last tour with the Stones and he left the group in 1992. The album cover is a painting by Japanese artist Kazuhide Yamazaki, whose work inspired the tour's stage design. There also seems to be a book floating around out there by this same gent, so clearly he’s multi-talented. JP Morgan in New York also have one of his pieces as investment art. 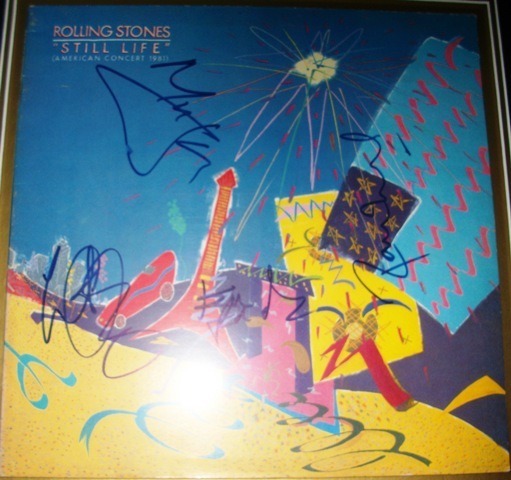 "Still Life" (American Concert 1981) is a live album by The Rolling Stones, released in 1982. Recorded during the band's American Tour 1981 in the latter portion of that year, it was released in time for their European Tour 1982 continuation the following summer. The Rolling Stones' American Tour 1981 was a concert tour of stadiums and arenas in the United States to promote the album Tattoo You. It was the largest grossing tour of 1981 with $50 million in ticket sales (the average ticket price was $16). Roughly three million concert goers attended the concerts, setting various ticket sales records. In mid-1981, the band began rehearsals for the tour at Studio Instrument Rentals (SIR) at West 52nd Street and 8th Avenue in Manhattan's Hell's Kitchen, the site of the former Cheetah Club. The Stones pre-opened the tour with a warm-up show at the Sir Morgan's Cove club in Worcester, Massachusetts on 14 September. Though billed as ‘Little Boy Blue & The Cockroaches’, word got out and some 11,000 fans pushed and shoved outside the 300-person venue. The Mayor of Boston stopped the notion of any further public rehearsals, saying "The appearance here of Mr. Jagger is not necessarily in the public interest." A Hal Ashby-directed concert film was also made from the tour, Let's Spend the Night Together, which grossed $50 million. Possibly due to the film most of the shows on this tour ended up being professionally recorded. To bootleggers there are currently 35 of the regular 50 shows from this tour in which more than half of the concert is available directly from the soundboard. This was the last tour of America The Stones would do until 1989. The Still Life album was preceded by their cover of The Miracles' "Going to a Go-Go", which became a Top 30 hit in the United Kingdom and United States, while follow-up single, "Time Is on My Side" managed to reach the lower part of the UK charts. 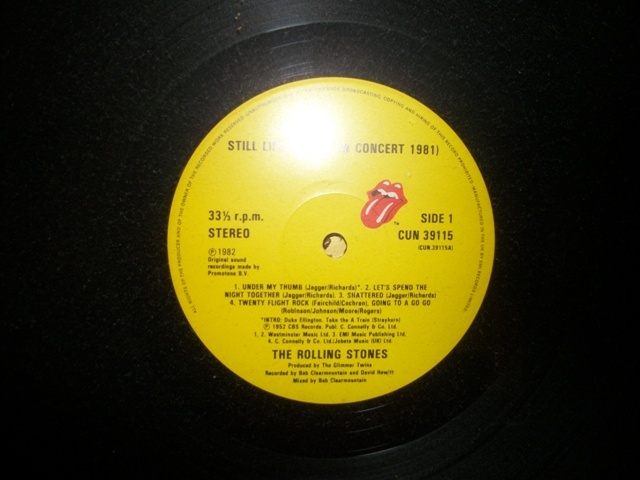 "Still Life" (American Concert 1981) was a commercial success, reaching #4 in the UK and #5 in the US, going platinum there, but was not critically well-received, being admonished for sounding too slick and lacking any rough edges expected in a Rolling Stones performance. Some critics state that the fans were let down too due to the fact that nearly half of the Hampton Coliseum rendition of "Just My Imagination (Running Away with Me)" was edited out for the release. In 1998, "Still Life" (American Concert 1981) was remastered and reissued by Virgin Records, and again in 2010 by Universal Music. So we who are not critics clearly don’t dislike it that much. All songs are by Mick Jagger and Keith Richards, except where noted.